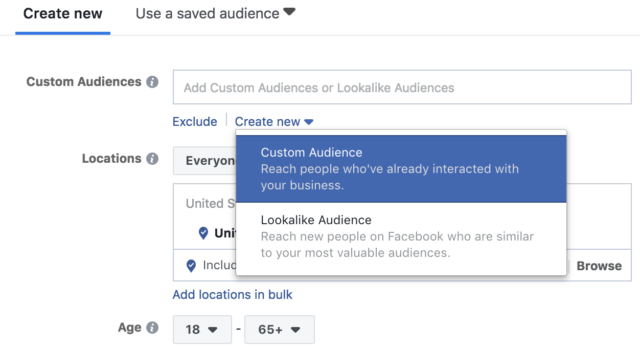 A complete tutorial for creating Custom Audiences in Facebook including audience creation, targeting options, how big your audience should be, and more. When it comes to ad targeting, there’s perhaps no platform more powerful than Facebook. The sheer amount of information they have on billions of users is unparalleled. Which is one reason many marketers expect better engagement on Facebook ads than on Google ads. Targeting based on demographics, interests, and behaviors gives you a lot of power for choosing a specific audience. But if you want to get even more granular, you can use Facebook’s high-converting custom audiences. Here’s everything you need to know about creating a Facebook Custom Audience. Note: Are your current targeting options driving a return on Facebook? Grab this free template and visualize your Facebook Ads performance in minutes. A Facebook Custom Audience is a targeted segment of people made up of your existing customers or leads that you can serve ads to. You can also choose to advertise to a subset of those people by using custom audience targeting, which we’ll talk about momentarily. Once you’ve chosen a campaign objective and selected an ad account in the Facebook Ads Manager, you’re ready to start creating your custom audience. 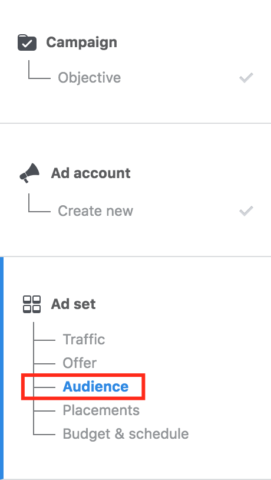 In the Ad Set section of the page, you’ll see the Audience options listed after Traffic and Offer. Click Create New and select Custom Audience to get started. You’ll now see the options listed above for the type of custom audience you want to create. To create a custom audience from a customer file, you need a spreadsheet with names and email addresses or phone numbers. You can also import a customer list from MailChimp if you have customer data stored there. Select the type of customer file you’d like to upload, accept the terms and conditions, and use the resulting window to tag your data in the spreadsheet. After that, upload it and follow the instructions to create your custom audience. 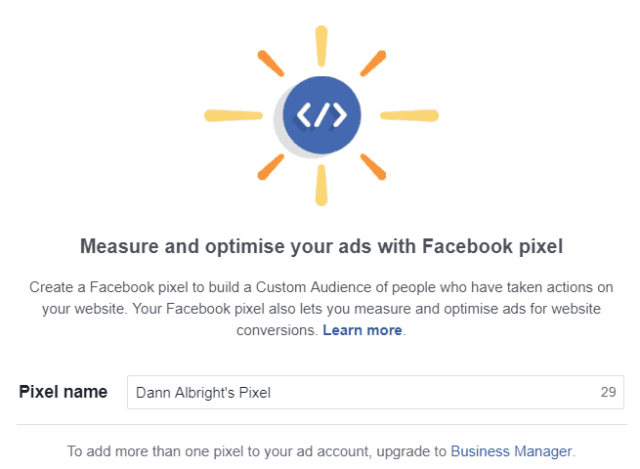 If you want to target people based on whether they’ve visited your website or if they took a specific action, you’ll need to install the Facebook pixel on your website or specific pages of interest. When you click Website traffic in the custom audience list, Facebook will show you exactly how to do that. After enough time has passed for the pixel to collect data on an audience, you’ll be able to use this option. Both of these options require that you connect Facebook to an external app. For app activity, you’ll need to use the Facebook SDK for iOS, Android, or Canvas. The same is true for offline activity. 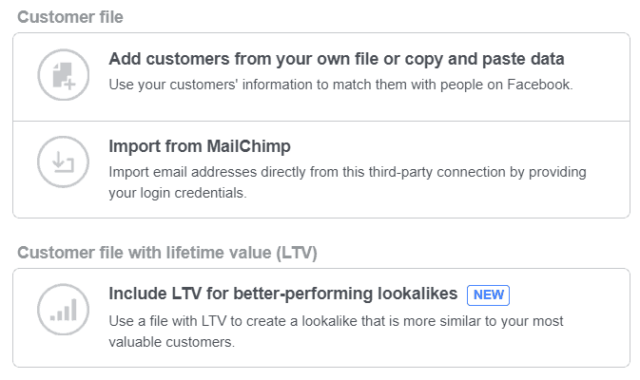 Facebook’s offline conversions API and partner integrations let you import data from external sources, including point-of-sale systems and CRMs. 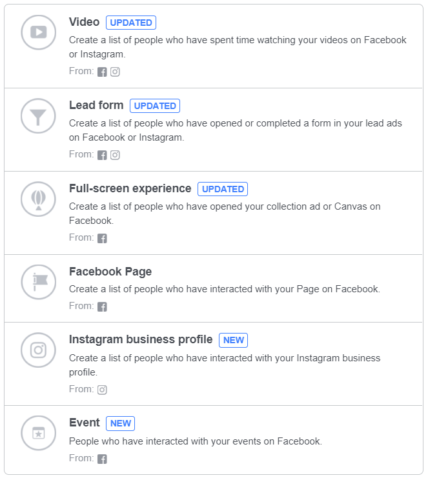 To see the full list of available partner integrations, check out Facebook’s help page for offline conversions. There are a lot of big names there, including Square, Marketo, Zapier, SalesForce, and Segment. 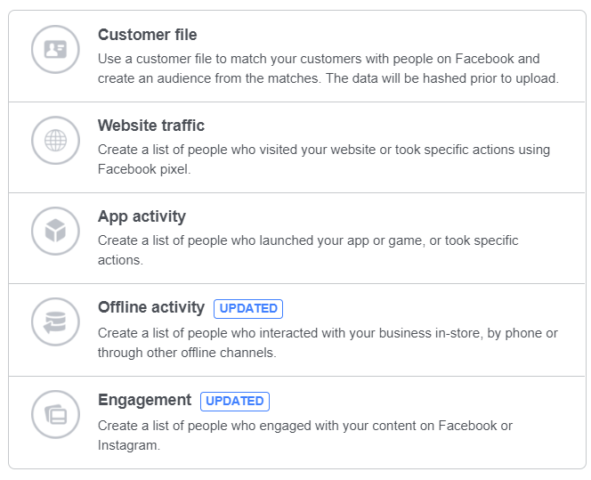 Once you’ve integrated your app or external system with Facebook’s platform, you can start creating custom audiences based on the actions that users have taken in those locations. This option lets you create a custom audience based on how people interact with your content on Facebook or Instagram. You can choose from six types of engagement, including watching videos, filling out lead forms, and interacting with Facebook Pages. Some of these options have more targeting options, like how recently the user interacted with the content or whether they filled out a specific form. Once you’ve created your custom audience, you can further narrow the selection of people who will see your ad using Facebook’s targeting features. Use the Detailed Targeting section of the ads page when you’re done creating your audience. You can target your ad based on demographic data like education, political leanings, income, and relationship status, etc., or based on broad or narrow interests that they’ve shown on Facebook. The behavioral category lets you target people who play video games, donate to animal-related charities, are likely to move to a new home, and a huge range of other categories. In short, you can create specific groups of people from within your custom audience. It’s the same targeting methods you can use with standard audiences but applied to your custom audience instead. You can use a Facebook Custom Audience of any size you like. You may find, however, that you can only upload spreadsheets of 10,000 entries at a time. If you want a larger custom audience, you’ll need to split it over multiple uploads. It’s also worth pointing out that a custom audience of less than a few hundred people might actually be too small to get good results. If you’ve used custom audiences for Facebook advertising in the past, you may notice that some things have changed. Partner Categories, for example, are no longer an option for targeting (though Business Manager lets you access some similar features). And there’s a new warning pop-up asking you to confirm that you’ve sourced your custom audience information responsibly. These changes came in the wake of GDPR and the Cambridge Analytica scandal. It’s possible that more changes will arrive in the future as well. And while it’s unclear how tightly Facebook will enforce these regulations, it’s important to follow them. Make sure you’ve gotten consent for using information to advertise before you upload it to Facebook. 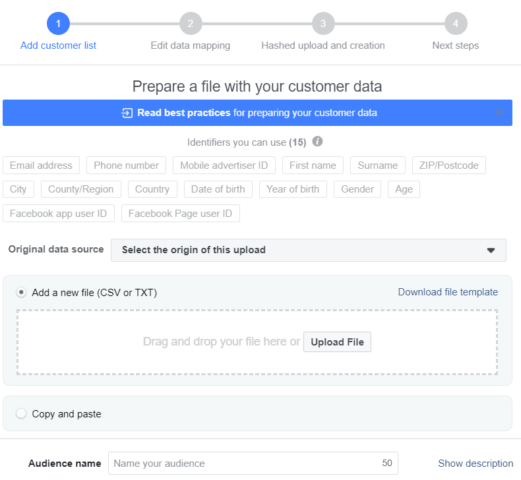 Custom audiences bring a new level of targeting to your Facebook ads. And with that detailed targeting comes great potential for converting leads into customers. So how will you know when you’ve landed on an audience that will continue to drive ROI? Download this free Facebook ads template and visualize your ad performance in minutes.